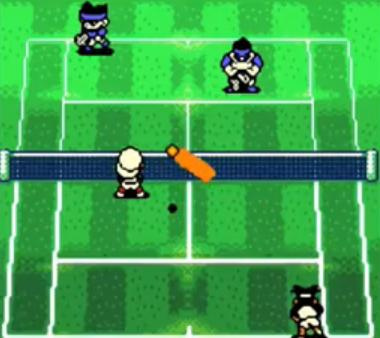 For whatever its name is worth, Mario Tennis doesn’t feature a lot of the red guy — at least at first. That may come as an initial disappointment to some who were drawn to the M-word. Now if you came for the “tennis” part, well, that’s a whole different story. 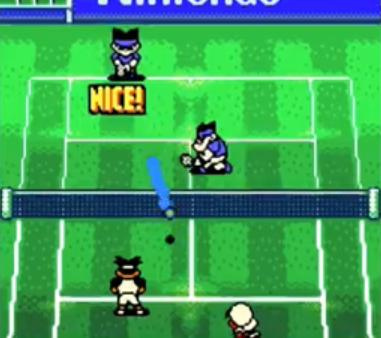 Mario Tennis will let you get into a game right off the ba--er, racket, if you wish, allowing a selection of courts and options for both singles and doubles play. A few character-based mini-games are also available at your leisure and offer a good way to practice shots and reaction time. The meat of the game, though, resides in the Mario Tour mode, placing you in the shoes of a promising new, non-Mario student at the Royal Tennis Academy. After choosing and naming a male or female character, then naming his or her roommate — and then after a rather long introduction for a portable title — players are free to engage in a variety of training games or take on opponents to move up the school’s ranks. The game takes on an interesting RPG flavour in its treatment of building your character. Completing training challenges or earning victories in matches grant experience points that can be used to level up one’s own character or their roommate, who serves as partner in doubles matches. Each level gained comes with a chosen increase in one of four categories: Spin, Power, Control, and Speed. Each category contains its own stats that automatically rise with the category rank, but some consideration must be taken when choosing areas to strengthen. Developer Camelot took a uniquely realistic approach towards balance here. Concentrating solely on power will come at the occasional cost of points in speed-related stats and vice versa. You may want to tip the scales, or you may want to spread points more evenly; the choice is left to the player. Levels and stats do make a difference, as even some of the starting training exercises feel next to impossible without first powering up. Once the ball gets rolling, however, it only seems to pick up momentum, with more and more points coming in until your character becomes a powerhouse. It’s rewarding and addictive. The numbers have even more meaning due to the fact that the controls for Mario Tennis are pleasingly responsive. Gaining levels isn’t a compensation for a poor control scheme at all and feels very much like real physical improvement. Beginners will be able to pick up and play quickly, but there is plenty that can be learned in the form of different shots that depend on position, timing, and button combos. Picking these up will prove very helpful later on when the opponents start becoming less pushovers and more technically inclined. The AI of computer-controlled characters feels as well tuned as the controls, with opponents steadily putting up more of a fight as you progress up the single and doubles ladders, providing challenge while rarely feeling like cheaters. Even your doubles partner, if kept decently levelled up, will prove dependable to the point that they will feel worthy of your actual trust. You may even find yourself cheering for your computerized compadre after he or she smashes it in to end a particularly exciting rally. This virtually-induced enthusiasm is a good thing, since linked play is no longer available in the eShop version of the game. 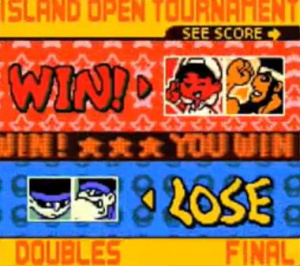 The old method of unlocking Mario characters through a copy of the N64 version of Mario Tennis and a Transfer Pak also appears kaput with no alternative presented, which means those respective characters’ mini-games also aren’t available. Mario and Peach will show up later on in the Mario Tour for your taking, but aside from them you have Luigi, Baby Mario, and Donkey Kong. Not exactly an all-star cast. But are they necessary? Mario Tennis still feels like a full experience without a lot of star power. The academy and its non-Mario patrons have a character of their own, now even more endearing as time has given the Game Boy Colour title’s bright hues and pixelated look a certain retro hipness. The music adds to the charm with chiptunes that know when to be pleasant or rousing. To be completely honest, I never really enjoyed how the Mario sports RPGs focussed so much on non-Mario characters. I usually enjoy Mario sports games because I enjoy playing them with Mario characters, and that's hardly possible in these titles. Still, when they're not considered to be true Mario sports titles (at least, I don't see them that way), they're still fun in their own right. The RPG elements were well implemented. This game is great! I played it a lot a few years ago, it's well worth picking up! Anyway, as I was saying, I don't see Nintendo doing these "transfer games" in the future. They could, make future transfer games, that use a passcode/word sharing system, like the Zelda Oracle titles. However, such a system does not guarantee that anyone that owns one of the transfer games, will purchase the other, when someone, would inevitably post the codes online. It's more of a dual-purchase guarantee to have the system, where both cartridges are needed, along with the appropriate systems, & transfer cables. I love the N64/GBC Mario Tennis titles. To me, the transfer features are a loss of gameplay, in the Wii/3DS VC systems. You have to ask yourself, how much gameplay is lost from these unemulated features, & does the loss matter to me? That is a gamer-specific question that determines your purchase. Just one unnecessary transformation in Shantae was no loss for me. The ability to be a completionist in the Zelda Oracle titles is a bit of a loss to me. But the loss(on both N64/GBC sides) of character transfer/gameplay/character/courts unlocked, that is quite a loss of gameplay to me. My personal opinion, treat, or rather consider this as a stand-alone game, like its GBA sibling, & you will enjoy it. It's a great title, thought I personally couldn't get over the loss of those kinds of gameplay features, so I now own actual N64/GBC carts of both, as I did when they were on shelves. Great review @Tim Latshaw, & @NLife! @SanderEvers: Points taken, & I stand corrected. To me this game is a 9 and Mario Golf for the GBC is a 10. I have both original carts somewhere. Mario Golf was a longer and slightly more rewarding experience partly due to the nature of the sport. I agree with Blue_Yoshi that not playing as Mario and Co. was genius and a crying shame that the tradition has not been carried on for the 3DS versions. I won't be buying them as a result. It is so much more rewarding to beat Mario at his own game than play as him. It is also a poor show on Nintendo's part that the multiplayer has been excised. I will have to get this game at some point. Mario Golf was excellent and this looks to be more goodness from Camelot!! 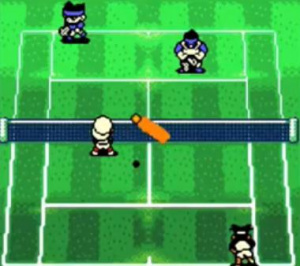 Ah the golden era of Mario sports games when the GBC Mario Golf was followed up with this awesome game. Will definitely pick it up again on the eshop. I don't really understand how the VC works on a programmable level, or how connectivity between the 3DS and WIIU works. But it sure would be nice, if I could download Mario Tennis 64 from the WiiU eShop, and transfer the custom characters etc. I mean if I can do it on a computer with emulation, come on Nintendo, that sort of extra service for fans is what makes you a hero to us. What exactly did you not like about Power Tour? Sorry, but the Mario Tennis series has never been one of my favorites. 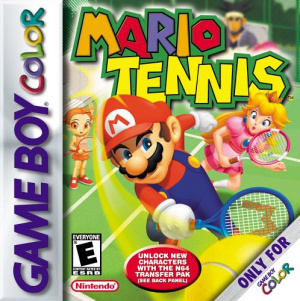 I liked the Game Cube and 64 Mario Tennis games just a little bit, but to me, the series just isn't really that good. They really should remake this game, or give it an actual sequel. Loved the story mode and RPG elements in this game. Made you feel like Mario was this epic celebrity you may never meet until the very end or something. 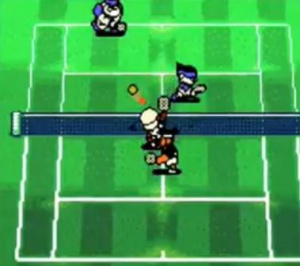 This is a truly genius game: building up your characters on the tennis school so they can become better at the sport, win local tournaments at said school, then you and your partner start to get REALLY good so now both of you get access to better equipment so you can train even harder, then when you are ready and feel like one of the best you can finally face off against the teachers of your school, la créme de la créme of the sport so you can become a champion, to finally face off against the mike tyson/mr. dream of your world, mario, so you can finally become a legend yourself after defeating him. If Nintendo bothered to put in the link features or actually allow transfer with the Nintendo 64 Virtual console version, then I would have download this. I'll just stick with my original copy. I still have the GBA cart, and while obviously better graphically I found it to be VERY easy. I might be interested in this one, if it proves to be more of a challenge. Has anyone played them both? 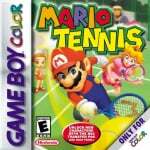 As a GBC then a GBA then a DS now a 3DS owner, i've found it strange i've never played any of these Mario Tennis titles despite the decent reviews they all seem to get. For a fiver i guess this is a decent one to start with. I want this but they didn't send me my paycheck so I have to wait a whole week. I've been wanting this game for years but I never had the chance my first time around, I want to play it now. 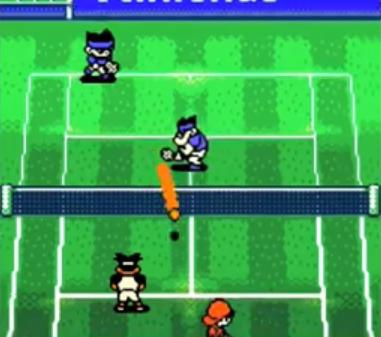 The characters from this game are playable in the VC version of Mario Tennis 64 by downloading a save file (that has them unlocked) available on GameFAQs to your SD card, so I bet someone could figure out to do it the other way around. @LightSamus You can if you live in North America. There's a save file at GameFAQs that you can download to the right folder on your SD card to unlock them in the VC version of Mario Tennis 64. I've done it myself, and it works just as promised. This was a great game but for me the key element was the use of the transfer pack, now that has been taken out and Nintendo were too lazy to put in a substitute I won't be dwnloading it.